Wedding bouquets and wedding flower arrangements artfully crafted as showpieces for your special day. Jackie designs wedding reception centerpieces and complimenting corsages and hair pieces using traditionally grown and natural floral elements, to include fresh picked florals grown on the farm. Jackie is a floral designer inspired by nature, on her farm and in the surrounding woods. Her floral arrangements combine farm grown elements with that of local producers and flower suppliers. Wedding flower arrangements include bridal bouquets, wedding and reception centerpieces, corsages and hair pieces—artfully arranged as showpieces for any wedding environment and color theme. 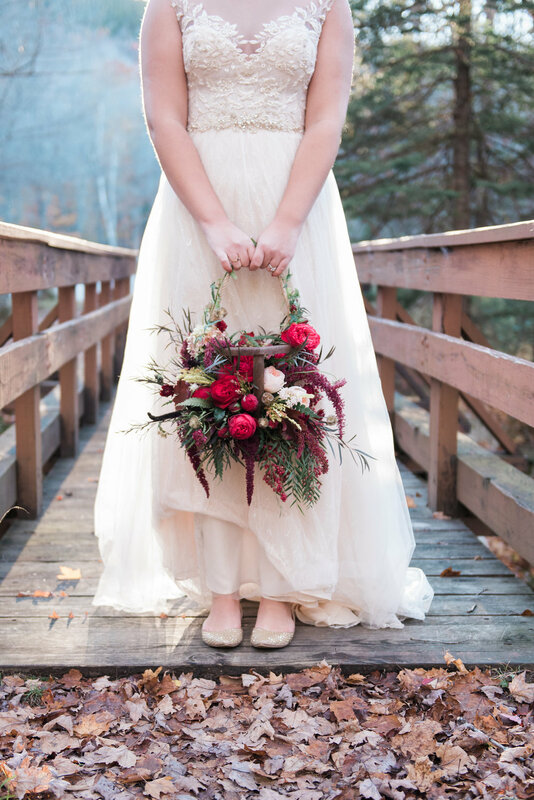 Wedding flowers are available for year round events to include winter wedding! Jackie enjoys working closely with clients to help them achieve the perfect atmosphere for their special event. From country to contemporary, Jackie's flower designs are original, timeless, and enchanting. She believes floral arrangements should be artistic, not budget-breaking, and therefore strives to make her pricing affordable. Jackie provides service within a three hour drive radius of the farm. For destination events, please call for more information. Call (207) 625-7733 or (207) 329-6888. You may also send an e-mail to jackie@moonsetfarms.com for a free consultation.